With eight children, 58 goats and a growing soap business, this family knows how to stay busy. It's all fun and games for Hewitt, Indigo and Jade as they play tag outside the entrance to the family business, Goat Milk Stuff. They laugh and chase each other around, but halt at the sound of a customer's car door closing. Now it's time for work. The retail room of Goat Milk Stuff is filled with a cloud of fragrances. Vanilla, lavender, peppermint, citrus, blackberry. It's not overpowering. It's not harsh. It's clean. Shelves filled with endless varieties of products line the walls - soaps, scrubs, lip balms and candles. Everything is in its place. Not unnaturally tidy, but neat enough to show it was arranged with care. Then we hear a small, high voice. "Hi." That's when it hits. There are no adults in this room. Eight-year-old Indigo takes her place next to the counter of her family's business as the customer, Bonnie Austin, strolls up to the entrance. She's in good hands. A minute later, Bonnie squats down next to a kneeling Indigo. Indigo hands Bonnie black drawstring bags filled with various bath fizzies. Bonnie smells each one obediently, trying to decide which scent to take home. "I have to buy something because she's so doggone cute." Jim and PJ Jonas have a thriving business at their 36-acre farm in Scottsburg. which is home to 30 adult goats and 28 new kids born this spring. Each of PJ and Jim's eight kids, ranging in age from 6 to 17, has a specific role within the business and are eager to show us. The family has told their story and touted the benefits of goat milk soap in O Magazine and the TV show "The Doctors." Today the business makes several hundred thousand bars of soap that ship all over the world, and they have grown exponentially every year. Seventeen-year-old Brett Jonas works right behind the retail room in the back room of Goat Milk Stuff. The room is filled with shelves - shelves that hold white trays of soap and shelves that hold boxes full of soap for shipping. As we walk into the room, three people stand at a long table placing various products into boxes and sealing them up for delivery. This is clearly second nature to 17-year-old Brett, as familiar as breathing. Brett is the shipping manager at Goat Milk Stuff and is responsible for filling all of the orders that come in every day. They've shipped their products to every continent - yes, even Antarctica, Brett says - and there was also an order for a Sandra Bullock. "It was somewhere in Oklahoma, though, so it probably wasn't 'Gravity' Sandra," Jim, Brett's dad, says. Brett is the oldest Jonas child and like many 17-year-olds, she's not sure what she'll do after high school. She does know one thing, though. She wants to be a mom. And college isn't a certainty. "I already have a good job," she says. "I'm a manager at 17. Not many people can say that." While she says she sometimes gets tired and doesn't want to come to work, she does her job with ease. When we arrived at Goat Milk Stufff, she was standing. When we left, she was still standing. We never saw her sit down once. Thirteen-year-old Emery looks exhausted, slouched in his chair, eyes half open - but with good reason. For the past three nights, he has taken the midnight to 3 a.m. goat shift. Each family member takes turns watching the goats throughout the night because one of them could go into labor, known as "kidding," at any minute. Zaphire went into labor one morning during breakfast. Brett and Jim raced to grab their gear, an experience they liken to firemen suiting up to fight flames. Jim joked that they need a fireman's pole to make the process even more efficient. By the time they arrived at the stall, Zaphire had birthed her daughter and son. Emery leads us to the red-roofed barn that houses the 26 pregnant goats - Spring is kidding season. The Jonas family checks on their does every hour and a half - even in the middle of the night, hence Emery's exhaustion. On top of the late-night watch, Emery keeps up with his duties as barn manager. He makes sure everything gets done, either by himself or other family members. That includes cleaning up, milking, feeding and watering the goats. A mixture of stale hay and dust replaces the smell of fresh air as we step through the door. We follow Emery and six-year-old Jade into a room with three wooden platforms: the milking room. Jade climbs onto one of the platforms to demonstrate. Her head goes through a wooden frame on the right of the platform and Emery locks her head in place. This keeps the goats in place while they're milked. We hear the bleating before we see the faces peeking through the fence. Jade and Emery climb over the gate with ease to join the goats in their pen and open the gate for us. We meet Sephora, a black goat who watches us closely. The closer we get, the more evident Sephora's pregnancy becomes. The goats aren't milked while pregnant and her udder looks ready to burst. Since Sephora is an older goat, she will likely have more than one baby. Her sides protrude more than looks comfortable and her neck is fully extended. Theses are all signs she is ready to give birth, Emery tells us. Redbird, Jade's favorite, lies contentedly in the pen. She's easily recognizable by a black stripe that runs down her spine. Jade rushes forward to pet her, but Redbird, in her pregnant state, isn't feeling up to the company. She stands up and walks inside the barn. Now the goats circle us. White, black, brown, tan, bearded and not, but all definitely pregnant. That doesn't stop the younger ones from jumping on us or attempting to eat our camera and notebooks. Zenith, an older goat, head-butts the younger ones who are stealing our attention. The young does begin to chew on our jeans, boots and zippers. They even unzip a purse. Their playful nibbles won't do much damage since they lack upper teeth, but nonetheless, we leave the barn much dirtier than we were before. The Jonases' journey to their goat farm started in New Jersey with an article about soy. PJ questioned information about nutrition and healthy eating that existed around 1999. She began researching, which led her to an article about the benefits of soy. One thing led to another until PJ realized she wanted a change from their New Jersey life. She wanted to live on a farm with chickens, dairy goats and start developing a more natural diet for her family. Jim, a junior high science teacher, found he was devoting most of his energy to other people's children. He wanted to enjoy his own children without worrying about grading papers and preparing lesson plans. PJ and Jim moved their family of eight to Indiana, where PJ raised goats and chickens and Jim worked as a trash collector. When PJ discovered how many chemicals were in her children's bath soap, she wanted something to fit their more natural lifestyle. So she decided to make her own soap. After more research on soap-making methods and recipes, she produced the first batch of Goat Milk Stuff. The formation of the company would follow two years later in 2008. At first, PJ made soap only for her family and friends as gifts. But when Jim's perpetually dry hands stopped cracking, she knew they had a special product. From the start, they knew that they didn't want their business to rely on craft shows and retail shops, so they created a website. Looking back, PJ realizes that Jim's trash collector job was actually a blessing in disguise. Since he only worked four days a week, he had time to help get the business started, a bigger challenge than they expected. PJ quickly learned that making the soap was the easy part. Managing the regulations and the paperwork was not. Their biggest obstacle, though, was coping with their rapid growth. Customer service became increasingly difficult as they grew, and they needed more physical space. They moved to Scottsburg from Charlestown just over a year ago and are already running out of room. "We have grown by double digits every year," PJ says. "Last year, our main focus was on construction and moving to the new farm, and even with that, we still maintained our growth." This popularity and success in goat farming isn't exclusive to the Jonases. It has been on the rise for the past couple of years due to the benefits of goat's milk. Goat milk soap is rich in vitamins and minerals, that contribute to healthier skin. Goat cheese and milk are easier to digest than cow's products. While other soaps and beauty products can dry skin out, fat molecules in goat milk products keep skin naturally moisturized. President of the Indiana Dairy Goat Association Tim Vanzant says he only uses goat milk soap. "I find that in winter weather, working outside, my hands become dry and cracked," he says. "Goat milk soap is more moisturizing." 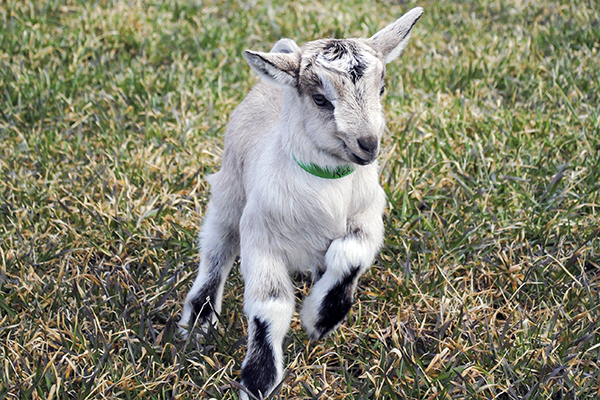 Until the last three or four years, goat farms weren't popular in Indiana. Vanzant says for thirty years, the state only had one goat farm, Capriole, that made cheese. "In the last couple of years, I've seen more pop-up. There's more interest in it." As we enter the back room of Goat Milk Stuff, Fifteen-year-old Colter Jonas has already begun mixing the oils for lavender peppermint soap. This is where the magic happens. Buckets and bottles spill out of cupboards and storage spaces. Shelves display a rainbow of herbs and spices. Dried soap splatters the floor. But the room still has an air of business among the organized chaos. A five-gallon white bucket sits on the floor filled with coconut oil, vegetable oil and lard have been added as the first step. A facemask with a plastic shield guards Colter against unwanted splashes. He adds lye and mixes the ingredients together with a pink, electric handheld mixer, stopping every couple of minutes so the mixer doesn't overheat. Then he pours in the goat milk, which he took from the freezer and thawed beforehand. He'll stir until the liquid comes to a pudding-like consistency. Colter flies solo when he makes the goat milk products. In the beginning, PJ made the soap herself. Then Jim started to help and taught Colter the process. Colter focuses on the bucket in front of him more than our questions. When we notice the "Grease" soundtrack on his laptop, he cracks a smile. He had watched it for the first time just the other day. He pours a half-bottle of peppermint scent and three-fourths of a cup of peppermint leaves into the "pudding." The remaining one-fourth cup of leaves is placed in a small, white bucket containing a lilac liquid. He mixes up both, and the 5-gallon bucket now holds what looks like ranch dressing. It's time to pour the two mixtures into a gray soap mold. Nine-year-old Hewitt and Alex join Colter to finish up the process. Colter places the soap mold onto a circular platform, and Hewitt spins the platform as Adam and Colter pour the white and lilac liquids simultaneously. The spinning ensures that the lilac color isn't masked by the dominant white mixture. Colter will check on the soap every couple of hours. If it overheats, bubbles can form, causing the soap to explode. After he shows us the process, Colter jumps right into cleaning up. The Jonases aren't strangers to working hard. Along with their jobs at Goat Milk Stuff, PJ and Jim homeschool their eight children. The Jonases weave learning and school into their daily tasks, with conversations about currency at dinner to learning percentages while working with customers. The Jonases believe everything is a learning experience. About every year and a half, it seems, the Jonas family goes through a major change. For 11 years it was adding a member of the family to the clan. After Jade, it was adding a new business, and then moving that business to a new location. A year and a half later, the Jonases' are developing a new addition to their business: food. By 2015, they hope to use their goat milk to make candy like fudge and caramel to sell in the store. Today, though, they have customers to serve. Bonnie Austin came to Goat Milk Stuff because her son, Josh Asdell, suggested it. He'd remembered Indigo, which isn't surprising. It's not often you see an 8-year-old running a store. Indigo also remembered Josh. He reminded her that the last visit he had put one of the lip balms in his pocket and couldn't find it when he went to pay. Indigo had seen him place it in his pocket and knew exactly where it was. She knew about the lip balm as she knew it was time for work when Bonnie drove up, as she knew all the details about the bath fizzies. Bonnie left that day with two bath fizzies and a good story. Lavender, peppermint and Indigo.